Remember the classic Bengali style Saree drape flaunted by Madhuri and Aishwarya in Devdas? 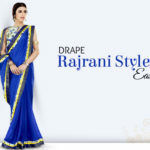 If you’re smitten by the lavishness of these Sarees, this Bengali style Saree draping video is for you. 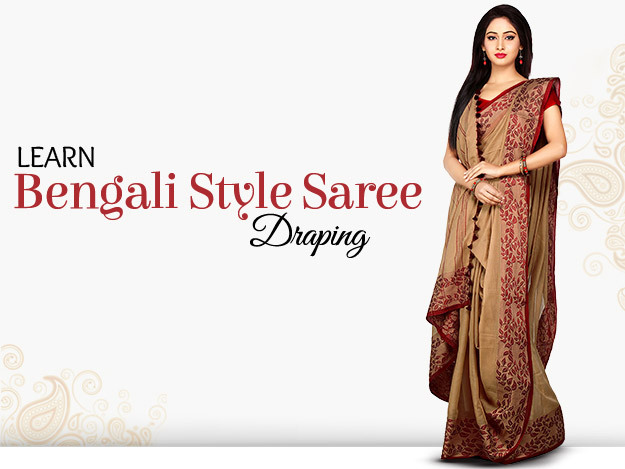 The Bengali style Saree is a must have for grand occasions and festival gatherings. 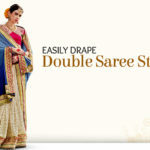 All you need is 3 minutes to learn this very classy style of saree draping. Let’s start with tucking the Saree end from the right side of the waist and until it completes one full round back to the right side. Then tuck the Saree across from right side of the waist to left side and then, the reverse from left to right. Repeat the step 2 times. Now make pallu pleats and place it on the left shoulder such that it makes a deep U in the front. Now pick a pallu corner and tie a trinket to it – the pack of keys or an antique silver keyholder. Bring the pallu corner to the front under the right hand and place it on your right shoulder. Always wear this Saree without a fall lining. 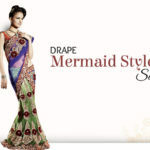 Wear your heels beforehand to get the right length of Saree at the ankle. Remember to tie a key ring or trinket to the pallu end. Keep safety pins close for quick pin-ups. Discover some of the finest of Sournachuri, Jamdani and Tant Sarees from India. They are made by expert craftsmen in Bengal.